November 27, 2017, 11:50 a.m.
Back in 2015, David and Kathleen Long beat odds of more than 238 billion to one by winning EuroMillions for the second time in two years. But how many people would keep playing the lottery after hitting the jackpot? New YouGov Omnibus research of 1,161 regular Lotto players (i.e. those who play once or twice a week) reveals that four in ten (41%) would continue playing even if they matched all six numbers. An identical proportion said they would stop playing at this point, while the remaining 18% say they don’t know whether they would or not. The results suggest that a significant proportion of Lotto players may be buying tickets for reasons that go beyond simply wanting to get rich. 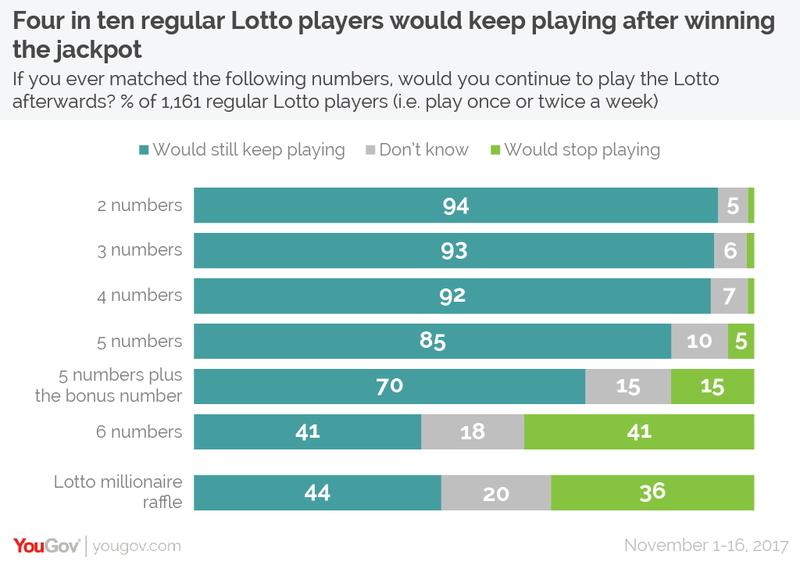 Regular players were similarly likely to say they would stop playing after winning the Lotto millionaire raffle (which each time guarantees one winner £1m and another £200,000) – in this scenario 36% would stop playing while 44% would carry on. Other wins are less likely to prompt regular players to give up the game: only 15% would stop after matching 5 numbers plus the bonus ball and a further 5% would stop after matching 5 numbers alone. Of course, you’d have to win the jackpot before worrying whether or not you should keep playing. 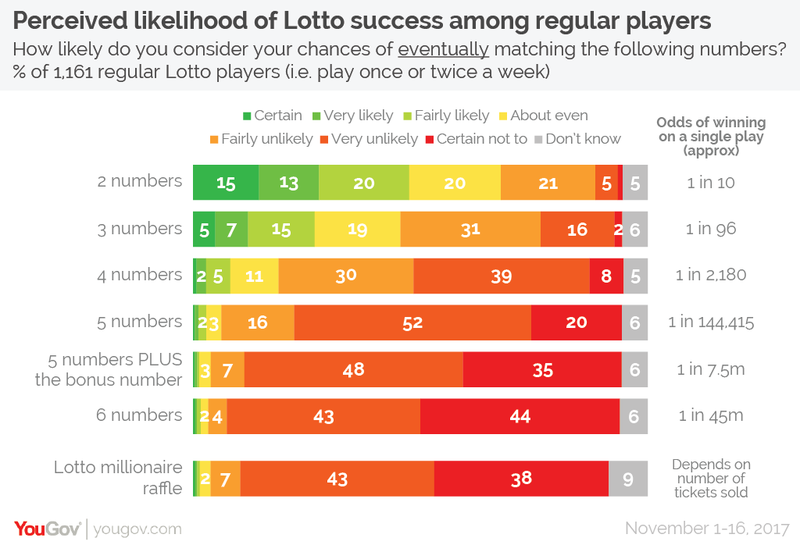 Unsurprisingly, with the odds of matching all six numbers on an individual play standing at one in 45 million, 87% of regular players consider themselves either very unlikely to or certain not to win the jackpot. Nevertheless, an optimistic 7% of regular players think their chance of scooping the jackpot is only “fairly unlikely” or better.